As usual, I can hardly believe another year has passed. Wednesday will mark two weeks until the calendar turns to 2014 and it seems impossible. Blogging this year has taken a back seat to just about everything else in our lives (as you can see from the scarcity of posts below). I have released myself any guilt I have had over it, knowing I would do this one big year-in-review post that somehow makes up for it all. 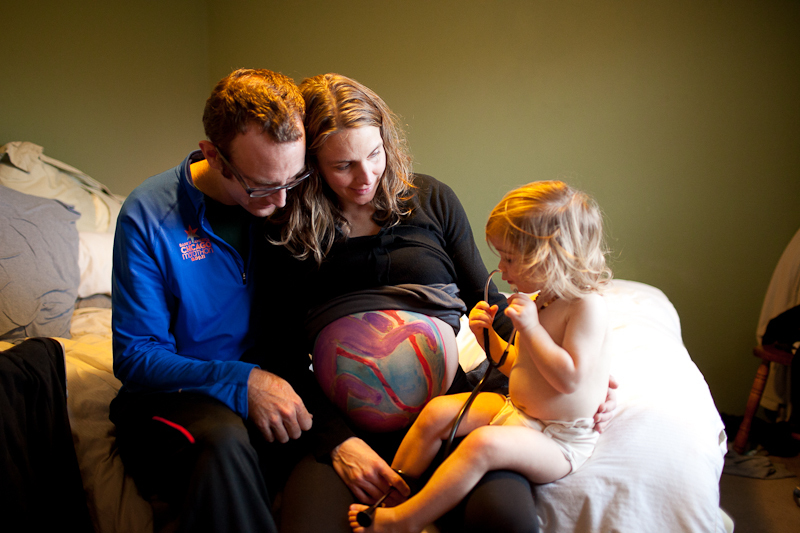 2013 started out at the end of our pregnancy with “Tiny,” who we would later meet and name, but in January we knew neither the gender or name of our baby. The month was filled with lots of doctors appointments, particularly at the end when Tiny decided to wait an extra 15 days before making her way out. Thankfully she was strong and healthy and came in her own timing, which was perfect! Our midwife painted Tiny’s position on my belly at one of our appointments. So cool to get more of a visual picture of how she was hanging out in there! What would winter be without a little GFU Bruin Basketball? We cheered on “our girls” through yet another winning season. 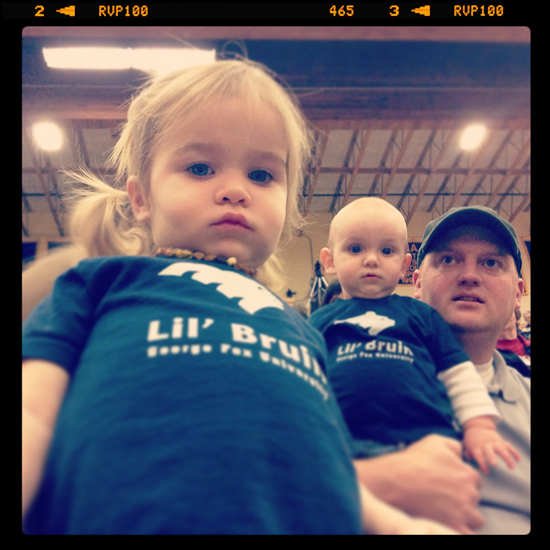 Sage (and cousin, Will) are big fans and love watching with us. Although I thought there was no way this baby could be born in February, she stretched things out just about as long as possible. I went into labor in the middle of the night on February 2 and she was born around 2:30pm. 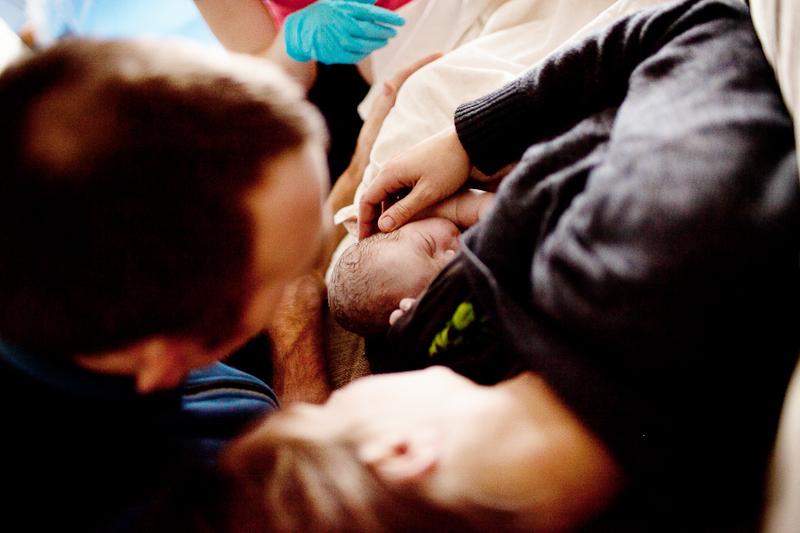 We were able to labor and deliver at home again as we had hoped. It was difficult but significantly quicker than the first time around. 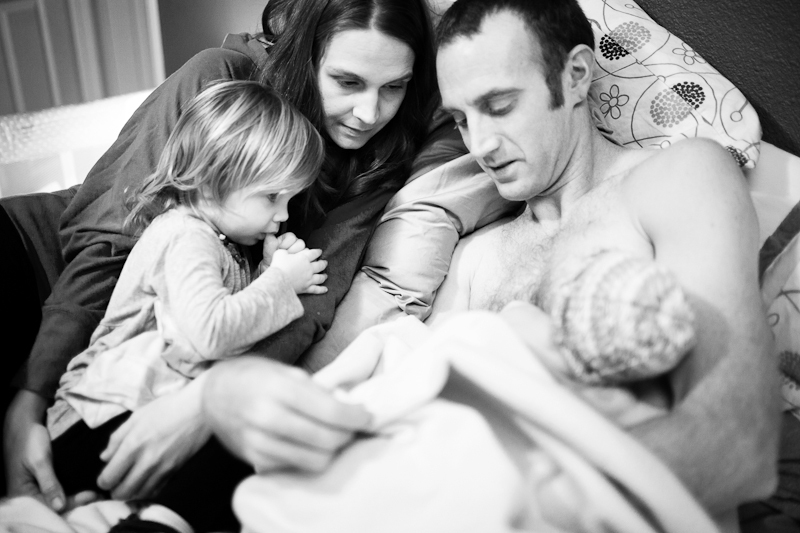 The two things I recall saying just after delivery were, “Thank God it’s over!” and “I never want to do that again!” We named our daughter Brynn and you can read more of the story here, if you’d like. We spent a good deal of time at the beach in February and March, driving out for an afternoon every couple weeks. Sage and John would play and climb the dune while Brynn and I stayed cozied in the back of our van with the back door open and a view that looked something like this, above. 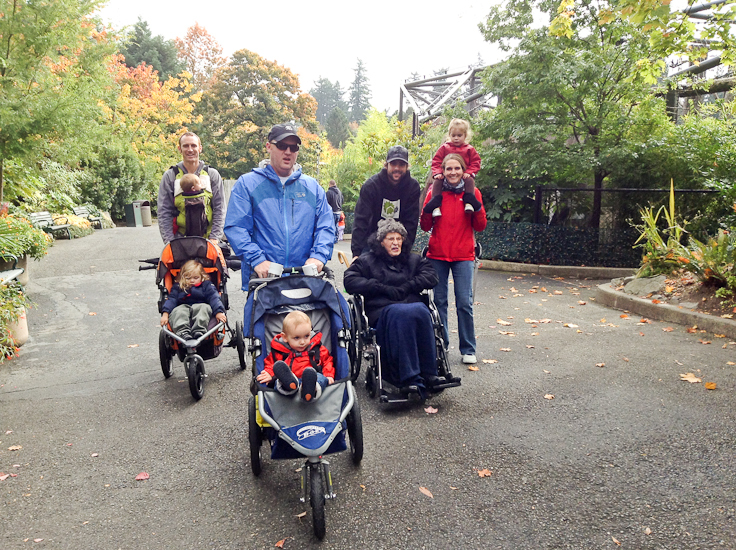 With Brynn just barely a month old, we celebrated Sage’s 2nd birthday at one of her favorite places, the Oregon Zoo! She enjoyed two firsts while there–a ride on the zoo train and an elephant ear. She wasn’t real sure about the zoo train at first, but ended up enjoying it. She was also uncertain about the elephant ear, but now asks for one every time we go =). More time at the beach! This was the low point of the month–after a trip to the ER late in February we learned my “dormant” umbilical hernia was now active, causing a significant amount of pain, and in need of repair. 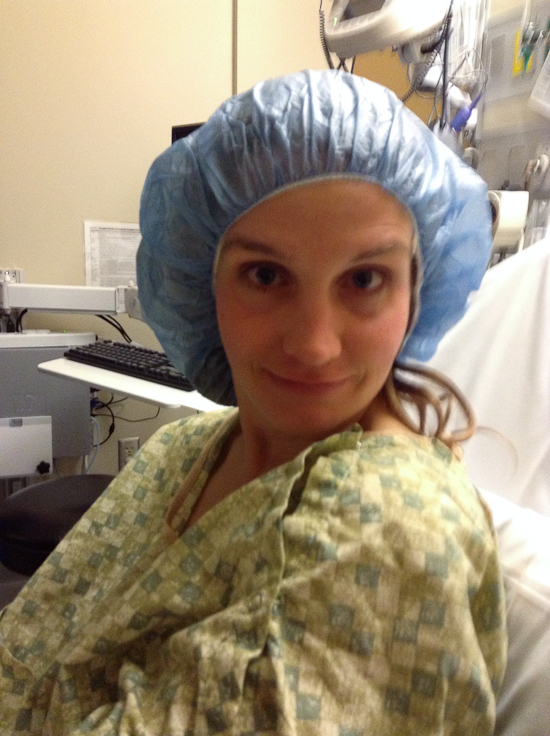 About a week after the ER visit I went under for an outpatient procedure to fix the hernia. This put me on the couch for several days which is not exactly the ideal place to be when you have a one-month old and a two year old, but with help from John, a few friends, and my mom I was able to rest and be back rolling along by the end of the week. 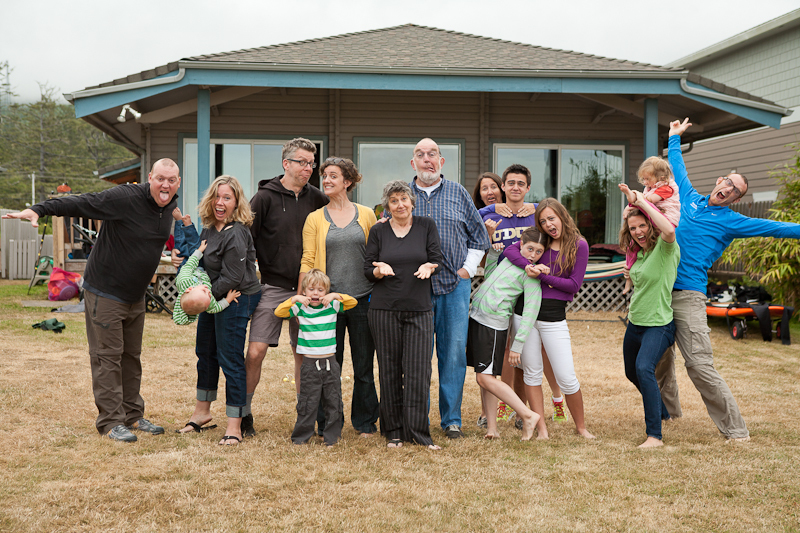 This was definitely a highlight of the year–having my entire family together for a few days here in Oregon. It’s been about three years since the last time we were all in the same place at the same time so it was fun to share time together. After a busy start to the year, April was a little more low key. As the weather began to improve I started the hunt for a play structure. We have a really great park down the street, but with a sleeping baby it was becoming harder to get Sage to the park during the day. We found this gem on Craiglist and aptly named it “Macy Park”. We have already put lots of miles on these swings and slide…even yesterday in the cold and wet we ventured out to play for a few minutes before it got dark. Purchase of the year?! The month started out with unseasonably warm weather so John and I made an impromptu date (so, so grateful that both of our parents live near and enjoy being grandparents!) 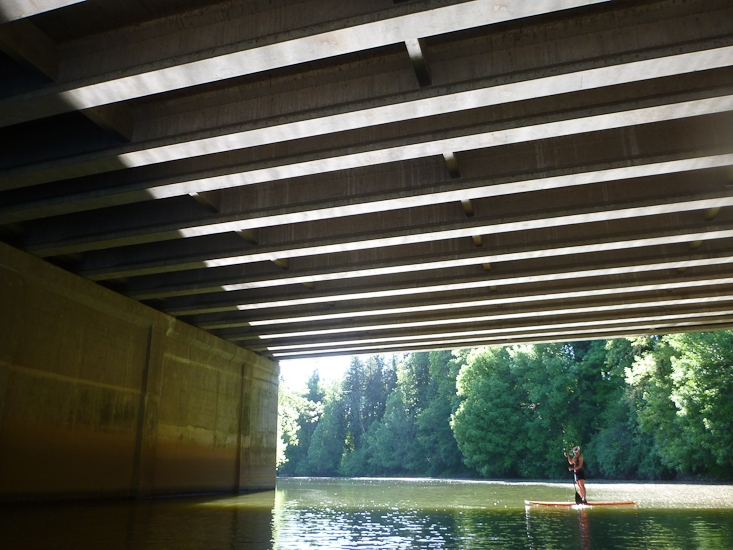 and went out on our SUPs for an afternoon on the Tualatin River. John has spending more and more time SUP-ing and has found his newest board-sport interest. He actually SUP’ed more than he surfed this summer and found he could jet over to the Willamette River (the boat launch is about 2 miles from our house), paddle around an island and be back home in just over one hour for a great workout. This photo represents my low of the year. In mid-May my big toe caught on a backpack strap lying on the ground in our home office. This was the beginning of about 6 months of big toe issues that were finally resolved in November after 3 weeks of physical therapy and an infected, ingrown toenail that had to be partially removed. Ugh. It was dumb, long, painful, and just plain annoying and I am so, so thankful it’s behind me! 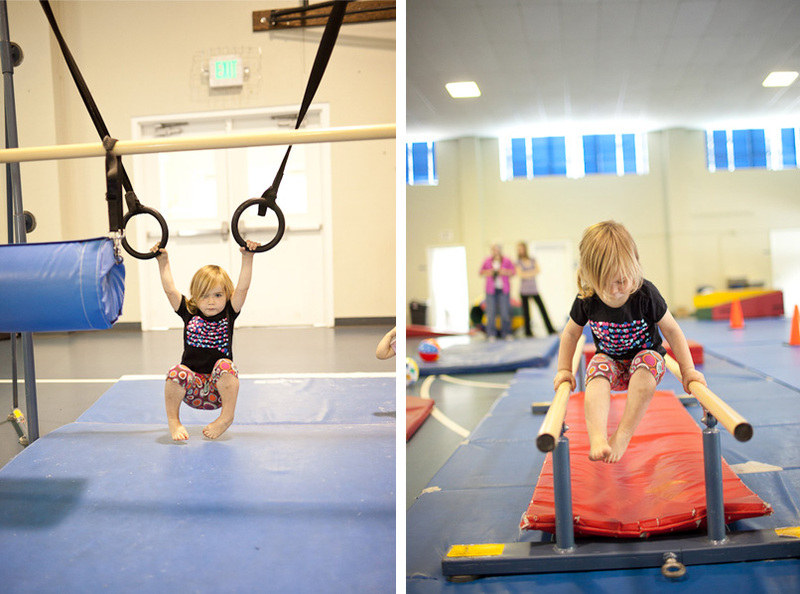 Started the month out with a “Mommy and Me” gymnastics class taught by our good friend, Christine. 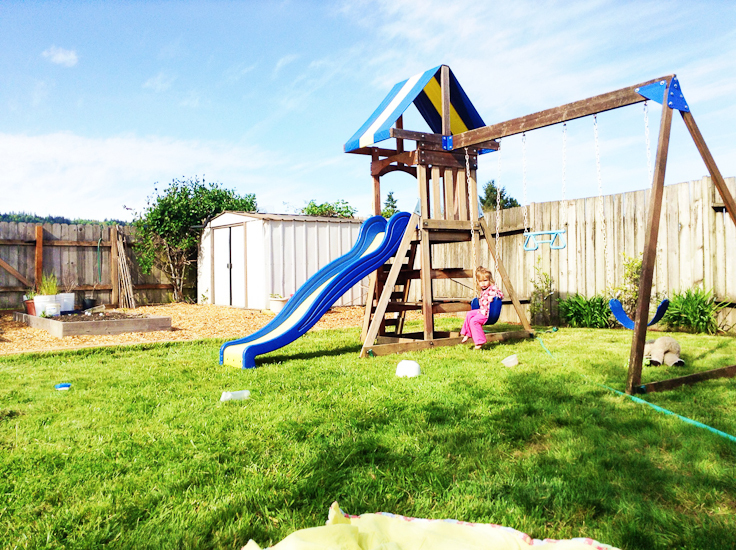 It was very, very fun–Sage learned about obstacle courses and tricks and how to do a great somersault. She also learned how to do a proper role call (in case you’re not sure: when your name is called, you raise your arms and wave your hands and say “woo-hoo!”) which she has continued to do with her paper and pen at home. Strawberry season!!! Our garden was a bit of a bust this year, but the strawberries did not disappoint. We enjoyed an abundance of strawberries which were freshly picked most days and eaten like candy. 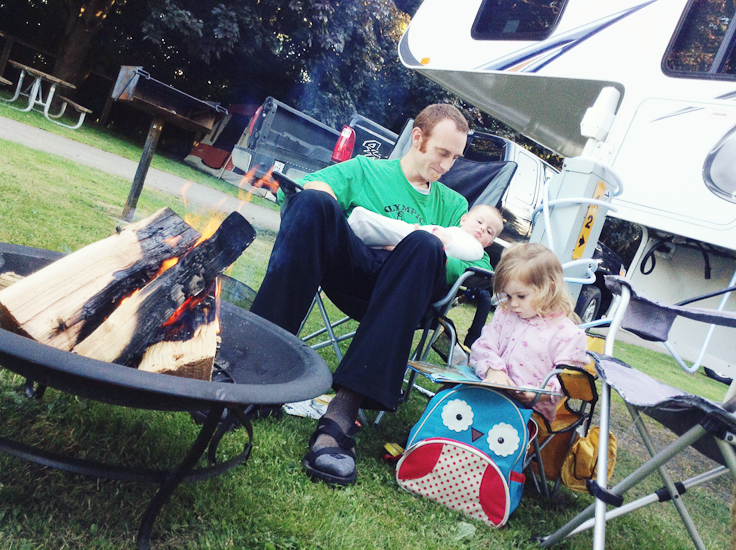 First camping trip for Brynn and our first of the season! We went to Seattle for a short weekend visiting dear friends, meeting new babies, and seeing the big boot and hat (we found this boot and hat in a magazine and had been talking about it for months). It was a wonderful time and we can’t wait to get back! 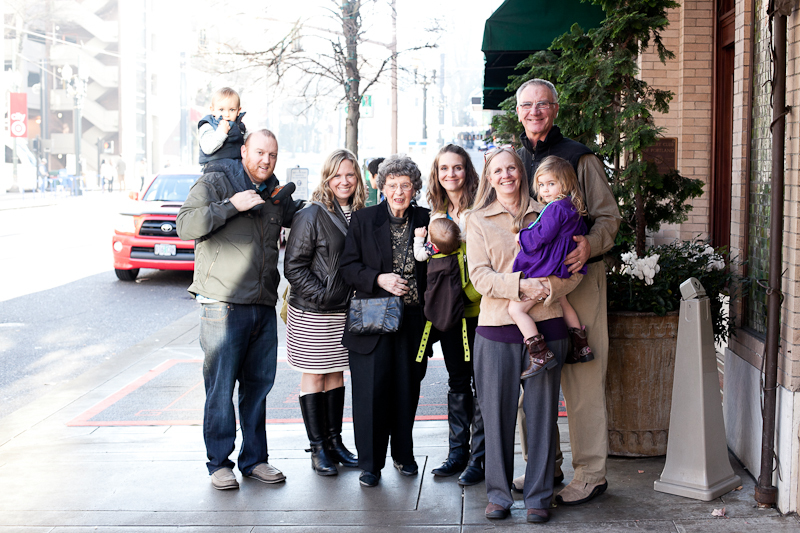 We also enjoyed spending a long weekend in Bend celebrating Pete’s birthday. Good food, good friends, mostly beautiful weather, a fun lake day, time in/on the river paddleboarding, and just relaxing together. The best! 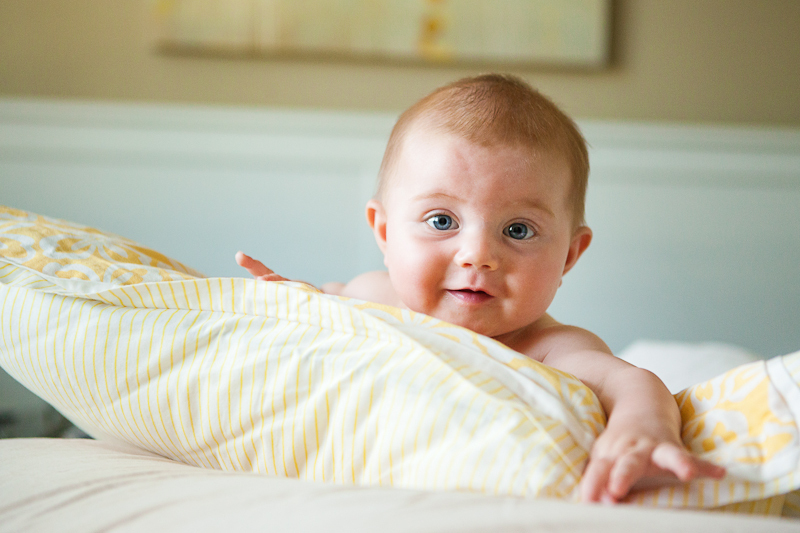 The above photo is a semi-recreation of a pic we took of Sage at the same age on the same bed. We kicked off July with something that has been our our list for about 10 years–camping with friends at Wallowa Lake, “Oregon’s Alps.” It’s about a 7 hour drive that we stretched into about 9, but it was well worth the trip. Our days were spent hiking, sitting by the lake, paddleboarding, and windsurfing (John). Evenings were spent around the fire learning Taize songs, yelling at each other so we could hear over the loud creek running through the campground, and doing some tricks with lights. 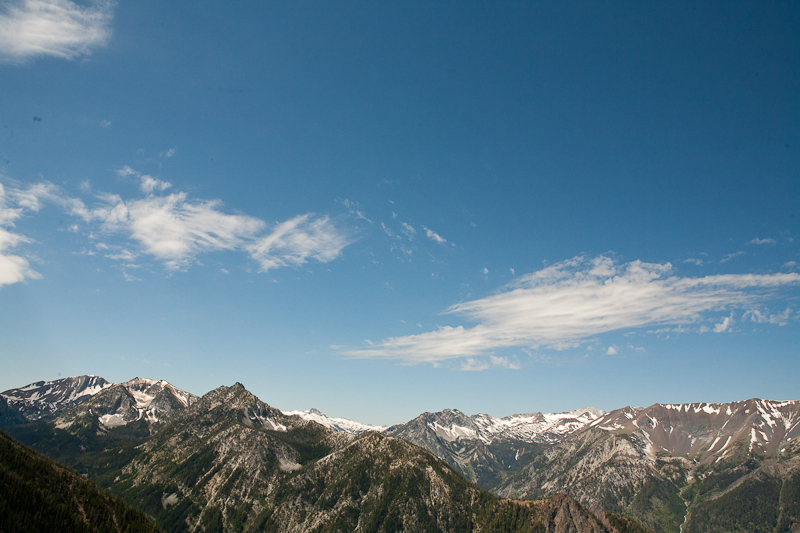 This is the view from the top of the gondola/tram, near the lake, looking out on the Eagle Cap Wilderness. 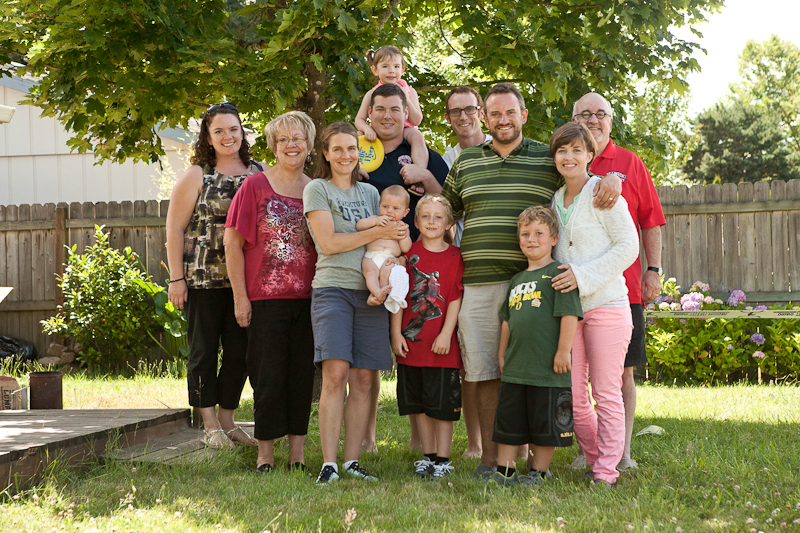 Soon after our return from Wallowa Lake these fine people showed up for a visit! The Rickey Family is very dear to us. Normally we get to see them in Phoenix when we are getting ready to head into Juarez over Thanksgiving. So glad we got to see them in Oregon since we didn’t get to Arizona or Juarez this year! Always a highlight of our summer, the annual Macy-Anderson Beach Trip was as fun as always. Spending time with these goof balls can’t be beat! 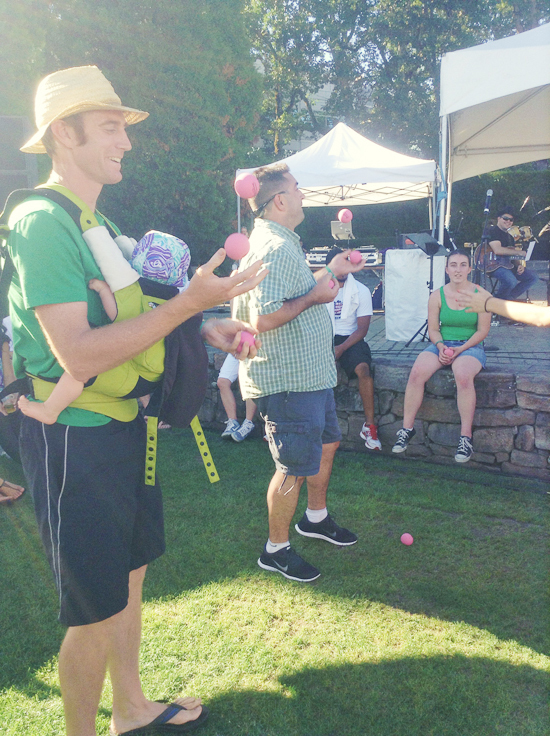 After years of wondering when it would serve us, John’s juggling skillz made us all proud when he won a juggling contest at a Nike’s Family Fun Day. And he did while Brynn was in the Ergo. Actually quite impressive! Many years have passed with only a few plums to speak of but this year we had an incredible crop. Almost every day since these plums started ripening we have eaten or at least looked at a plum. 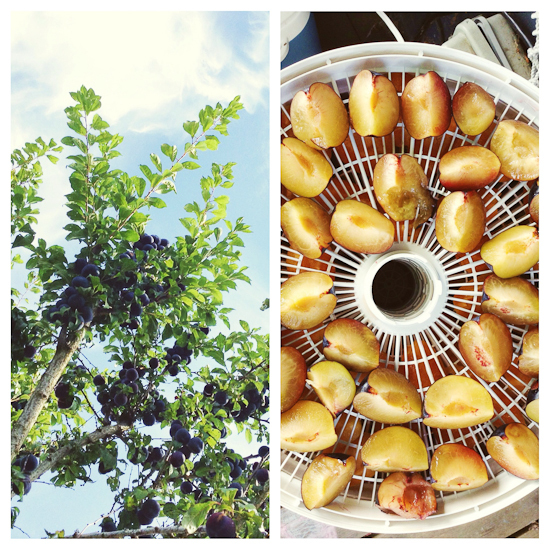 Fresh plums, dried plums, frozen plums, cooked plums…we have enjoyed our plums! John’s birthday was spent camping at the beach. It was really a nice weekend up until the last 18 hours when there was constant rain with periods of heavy downpour which meant packing up in the rain. Everyone had great attitudes and Will loved running around in his duck suit, stomping in puddles. The year wouldn’t be complete without a trip to the Oregon State Fair. As you can see Grandma Williams came with us again! 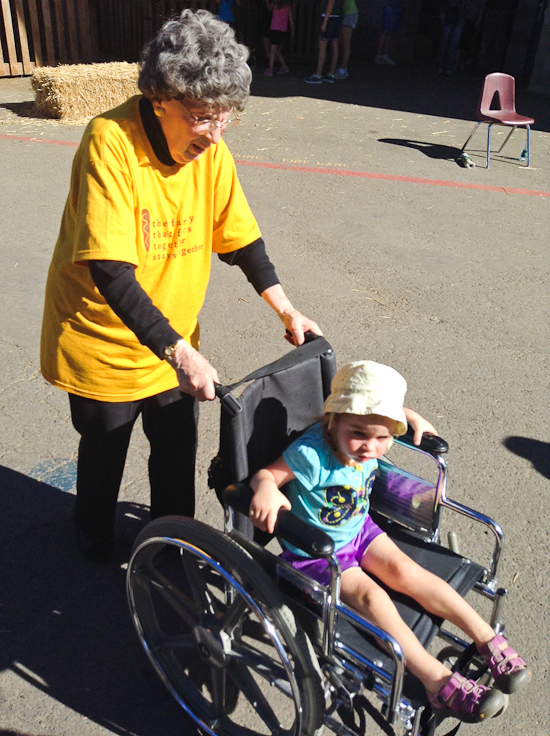 At 94 she just doesn’t stop moving! After years of saying “we should do that” we finally committed to making a road trip to Santa Cruz, California to see our friends Nate, Allison, Sidney and Stella who have the privilege of living and working there. It was a long time in the car with the two kiddos–we took two days to get down and two days to get back–but they were troopers. 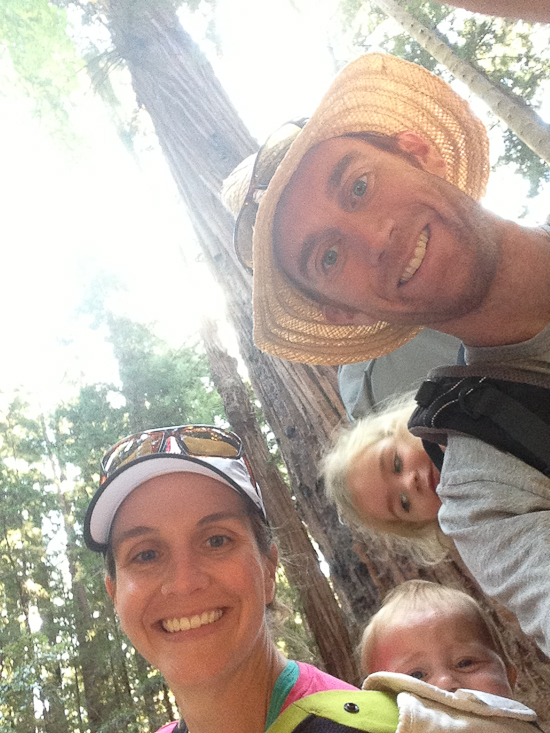 We spent the week camping in our friends’ front yard, hiking among the Coastal Redwoods, watching the ocean and surfing (John), resting and napping, and just playing together. Brynn started crawling, Sage made fast friends with the big kids, John and I got to go on a canopy tour, and we got to see what life is like for our friends. Earlier in the year John had an idea to create a mystery trip for Grandma. The local cousins got our brains together and planned a fun day which included breakfast at a local diner, a morning at the zoo, a ride on the Max train to the Portland State Farmers Market, lunch at the market, a streetcar ride to the Portland Aerial Tram, a ride up and down the Aerial Tram and then traced our way back to the zoo and home. A very fun and very exhausting day! Halloween! 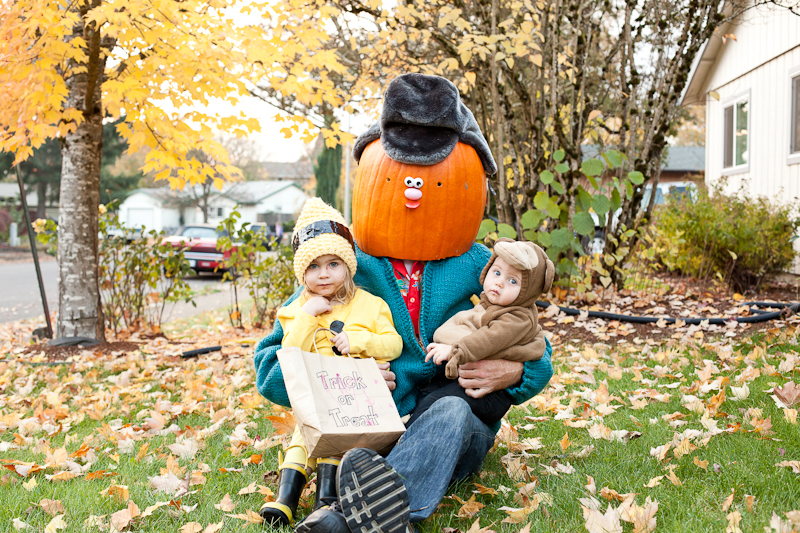 This year was the first that Sage got to go trick-or-treating. 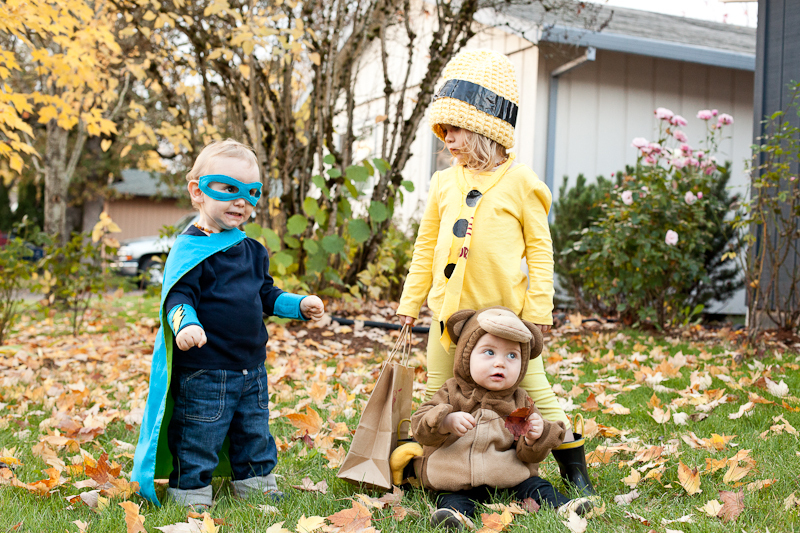 One morning I was explaining to her that she would get to dress up in a costume (she quickly chose The Man in the Yellow Hat, from Curious George), go to her friends’ houses, and they would give her candy. She was pretty stoked. Then I told her you could take the candy to the dentist and they would give her a toothbrush and she thought that was the best news ever. She didn’t forget it either. She would tell people that she was going to take her candy to the dentist for a toothbrush and she was all in. 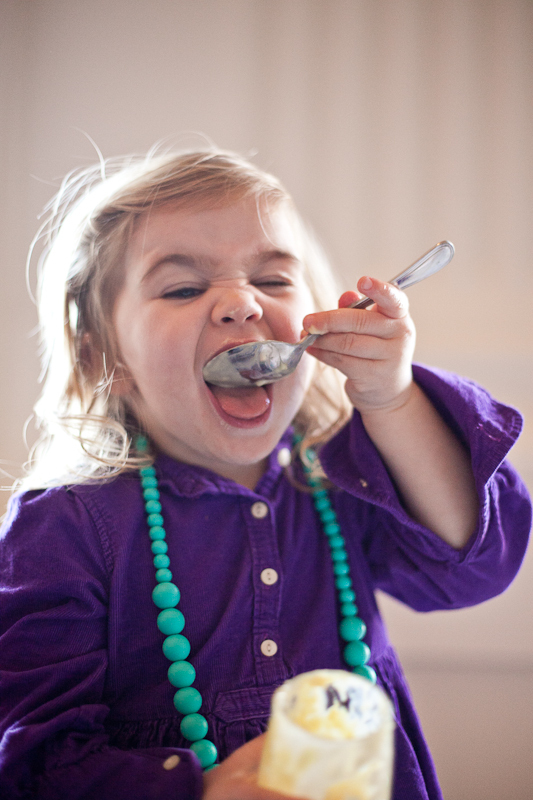 That is exactly what we did (we did let her have a few pieces) and it worked beautifully! Probably the only time that will work, but it was fantastic! Normally November is filled with getting ready to go to Juarez for, what has become, an annual Thanksgiving trip. With Brynn being a very active kiddo and remembering what it was like to have Sage there at the same age, we decided to take a year off. While we missed being there, we enjoyed our time home as well and got to try out some new things, namely, Members Preview Night at ZooLights (two thumbs up!) and a Thanksgiving buffet at The Governor Hotel (yum!). Sage enjoyed the buffet too. I think her highlight was the banana pudding. Already?! As we look back it has been a wonderful year. 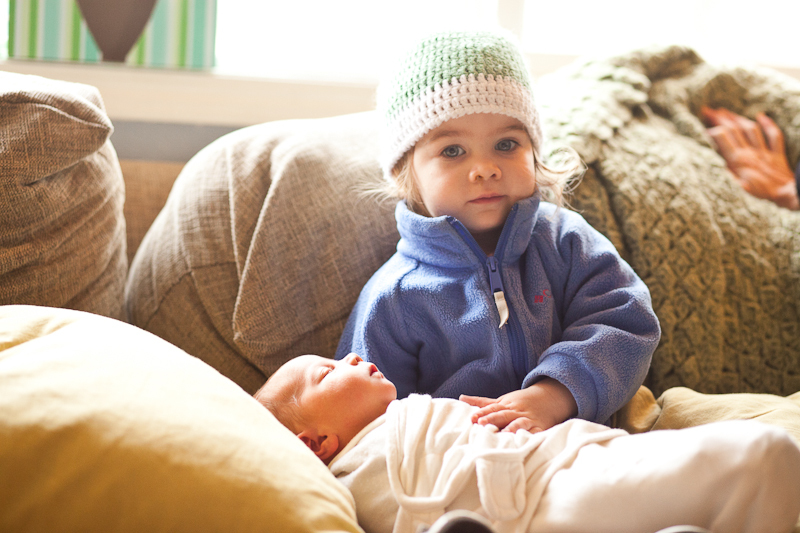 Sage and Brynn are healthy and growing strong. 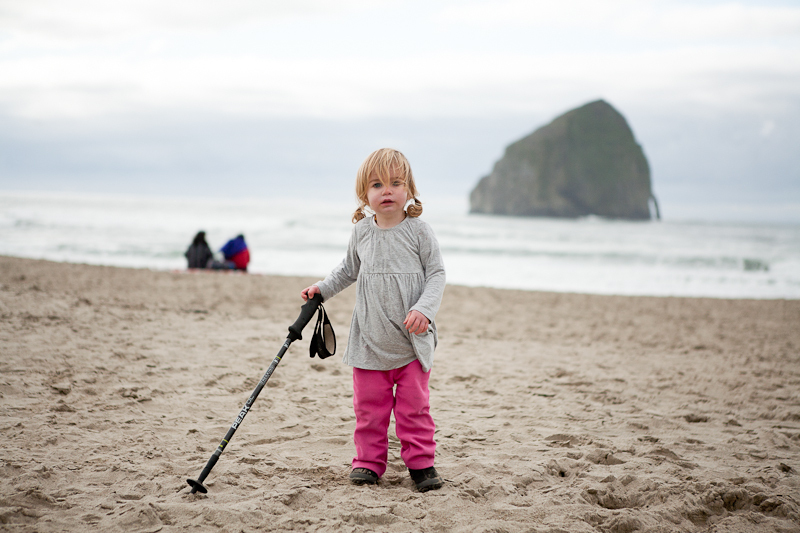 Brynn is on the cusp of walking any day/week now. She has started signing and it’s so fun to be communicating with her. She loves her sister and following her around, pulling things off shelves and out of boxes, rolling balls, and climbing up stairs and ladders (yikes!). Sage’s favorite activities are reading, playing “shopping” and “library/storytime,” doing puzzles, going to the park, climbing on things, and doing art projects. John completed his 10th year at Nike and together we wrapped up our 5th season as photographers. The photography business occupies most of my weekday afternoons which normally fits well into nap time, although most days I could use one too! We are looking forward to 2014 as Brynn turns 1; Sage turns 3; John’s brother, Taylor marries an awesome gal, Beth; we celebrate our 10 year anniversary; and hope to return to Juarez for Thanksgiving. 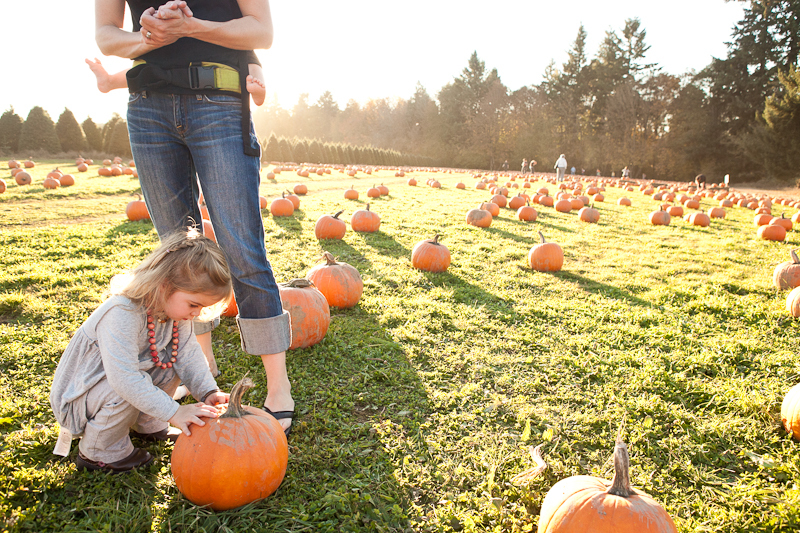 So, so, so much to be grateful for–words and pictures cannot accurately express how full are our hearts. Sage received a Mr. and Mrs. 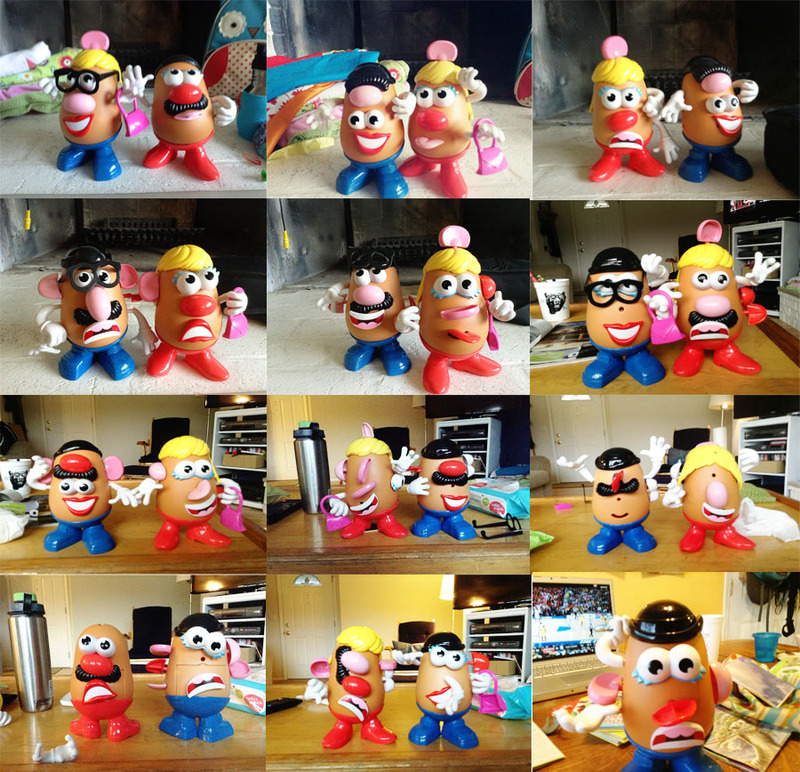 Potato Head for her birthday and nearly every day has been creating new personas for these two. I didn’t know there were so many ways to put the Potatoes together, but when noses don’t have to go where noses are supposed to go it opens up a whole new world. Somewhere along the line I took a photo of one and now every time she creates her Potato People she asks for a photo to be taken. This morning after one such ask I realized my iTouch was full. Something needed to be done with these potato pictures! We officially named “Tiny”, Brynn Elane and haven’t really referred to her as Tiny since she made her appearance. Now seven plus weeks, she is anything but Tiny and has continued to impress us with her healthy weight gain and the rolls we continue to discover (Sage never had single roll so this is a new thing for us!). 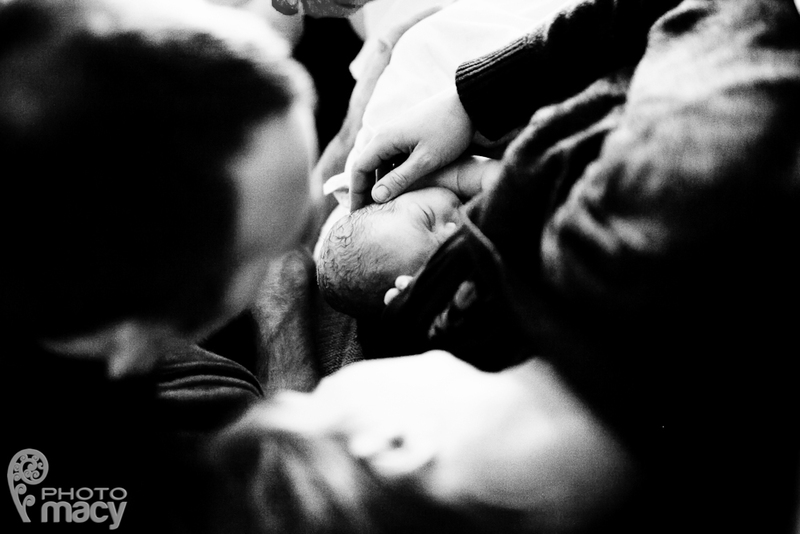 A little bit of the birth story: Due dates are always a bit of a moving target and this one was no exception. Sage had been 10 days late so we anticipated this baby arriving late, but were also kind of putting hope in the statistic that second babies tend to arrive one day earlier than the first. Brynn arrived 15 days post-date, but really, she was perfectly on time. The last five or six or seven days were tough, though, for many reasons: Sage and I both came down with colds; our midwife was very ill; we had to attend several extra appointments to insure the baby was doing well; and it just took a toll on us mentally and emotionally. Needless to say, we were more than ready for labor and I was actually kind of looking forward to it. I was starting to doubt I would ever go into labor and had started implementing our plan to naturally encourage labor to begin. Had labor not begun when it did, the next step was acupuncture. So, after lots of walking, “membrane stripping”, more walking, and a little dance party, my water broke. Contractions started slowly which allowed me to rest and for John to get Sage off to my parents. Things picked up after Sage left as I moved around the house more to encourage Tiny to come on out. After 11 hours of increasingly difficult labor and lots of contact with our midwife, Tiny moved into position and active labor began. It was, as they say, “fast and furious,” and Tiny was born within less than an hour (a very challenging hour!). I couldn’t have been more relieved to be done with labor and waiting! Brynn Elane was born at 2:27pm, weighing 8 lbs 4 oz, and measuring 21.25 inches. We chose the name Brynn, which means optimistic or hill (we prefer the former =)) some time in late December/early January, because we like it. The name Elane is after my grandmother and is also my middle name. 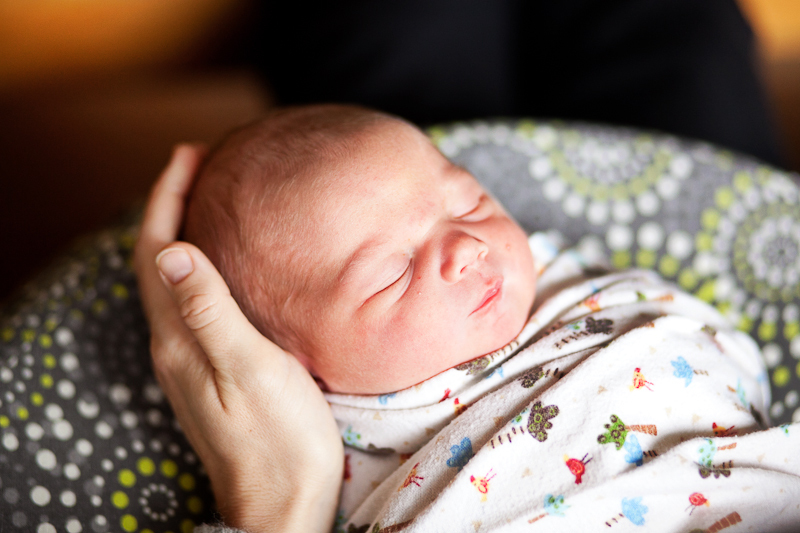 We were very glad, once again, that it worked out to have this baby at home and so blessed by the amazing team of midwives who cared for us throughout pregnancy, labor and post-partum. It was wonderful to celebrate a few hours after birth with our family over Abby’s pizza and root beer! Things haven’t slowed a second since Brynn’s arrival–surprise, surprise! John was able to take nearly a month at home, which I was grateful for and he loved every minute of. He returned to work the first Monday of March and the next day he had to take off to accompany me to the hospital for a minor surgery to repair an umbilical hernia. Surgery put me back on the couch for about four days. We are thankful to be through everything and beginning to create our new normal. Enough words, let’s see some photos! This is our collection spanning from day one (photos taken by Linsey Macy & one of our midwives) up through probably a week or so ago. Here’s a little documentation of the last 4-5 months of pregnancy, showing the progression of growth of our little one. I’m pretty sure if we didn’t have calendars or photographs I would be completely useless in remembering what in the world took place over the past year. A little scared to see how two kids alters my brain power! In preparation for the 2012 Winter Olympics, we kicked off the year with an Olympic themed New Year’s Eve party complete with a parade of athletes and serious Olympic competition (on the XBOX Kinect). Our own winter sport endeavors extended to a handful of trips up to Mt. Hood for snow-shoeing and telemark skiing (John’s first year giving it try). This particular photo is from Sage’s first snow shoe–we took her to the top of the Palmer Glacier (you can see Mt. Jefferson in the background). We have been talking with friends for ages about that old Presidential Fitness Test we all did growing up in PE so we decided to take on the challenge once again. We were quite impressed with our over-30-selves as we all (I believe) passed every challenge, excluding the pull-ups. John and I both ran our fastest miles ever in our lives which was pretty awesome. John’s time was around 5:45 and mine was about 7:20. 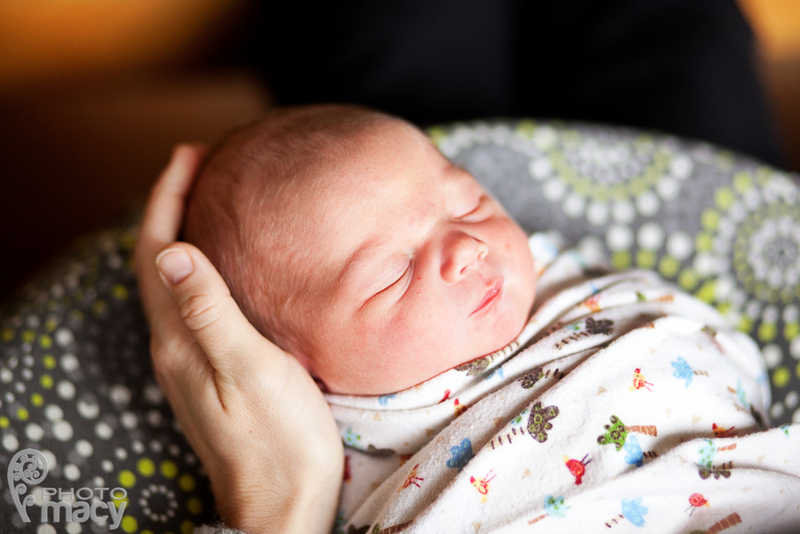 A HUGE, HUGE highlight of the year was getting to welcome William Merrick Macy into the Macy Family!!! Erin even got to be at the birth! We have been loving getting to know this kid ever since. 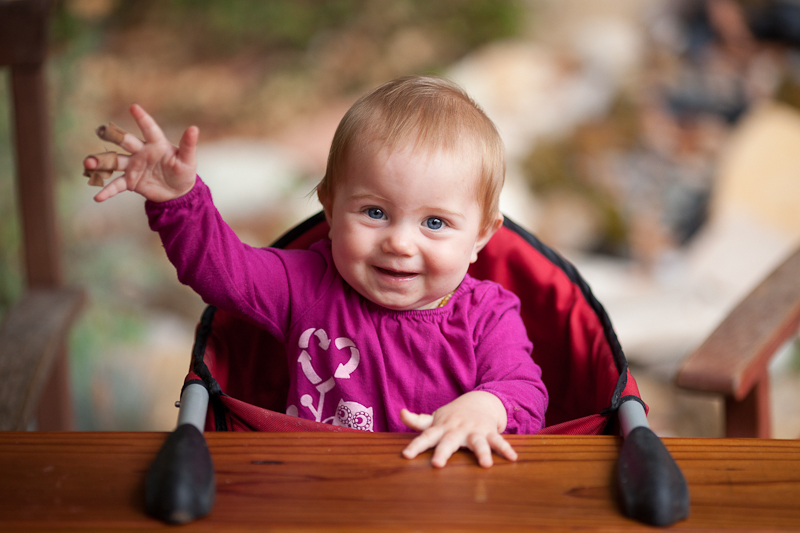 And… one of our favorite pictures of Sage from her first year was taken in February. She’s a beauty, isn’t she? We are hopeful she’ll grows out of it by middle school and that it’ll come back around somewhere in her late college years =). February always brings a lot of George Fox University women’s basketball, of which we try to be faithful fans attending as many home games as possible. Another February highlight which we do not have a photo of is the Justice Conference. This was an incredible weekend conference, held this year in Portland. Every speaker could have been a key note speaker and every presentation was impactful. Good conversation and good action has come from this weekend time. Our sweet girl turned 1 in March and we celebrated with family! We learned quickly that Sage likes to collect things! Demonstration below–she uses her new birthday present to collect all her favorite toys. Beach day! Although it wasn’t Sage’s first trip to the beach, it was her first trip at an age where she was interested in exploring the sand. Later in the month we joined the throngs of movie-goers on opening day to see Hunger Games. John read the entire series out loud during and just after pregnancy with Sage so it will always have a special place for us. Our girl became a book reader! She hadn’t really be interested in books, but just after turning one some sort of switched flipped and she is a full-on book lover. We probably spend close to an hour a day reading books. Hence, we like to go to the library often and get a little variety in our book diet! On Easter afternoon we left our daughter with a baby sitter and scored (cheap) floor tickets to Wicked. It was so fantastic! Can’t wait to see it again! We completed our (dare I say, first, but not last?) 100K bike ride (about 60 miles) in Corvallis. It was a great route and we quickly learned how people do this–it’s all about the snack stops. The first was at a bakery where they were giving away cinnamon rolls. That’s what I’m talking about! It was a satisfying and fun ride and so great to be able to do it together. Sage didn’t tag along for this one–we figured four hours in the bike trailer would be a bit much–but she got to have a fun weekend with her grandparents instead! May was the point of no return. Somewhere in mid-August we realized that since the first weekend of May we hadn’t had a break. All good stuff, though! 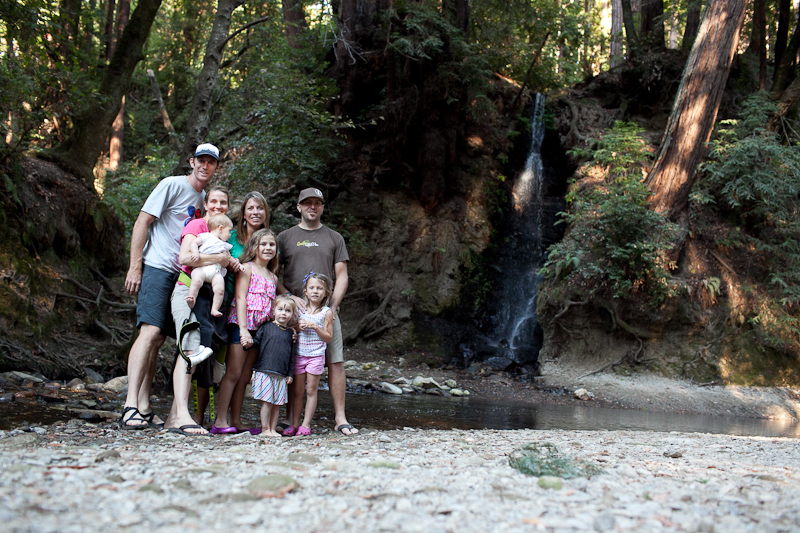 Visits from family and friends, camping trips, photography, and much more was packed into the spring and summer months. One of the other good things was a clothing swap some friends and I organized. Our church basement was turned into a used clothing store and it was a success! The first pic below is of one of the car loads of clothing we transported to the church. A visit from cousin OK! He and his mom came to meet cousin Will and we got the bonus of spending lots of time with him too! Sage’s first pig tails! Oh man and they are so long now! John made the “investment” in a slack line and we all had fun playing on it throughout the summer. 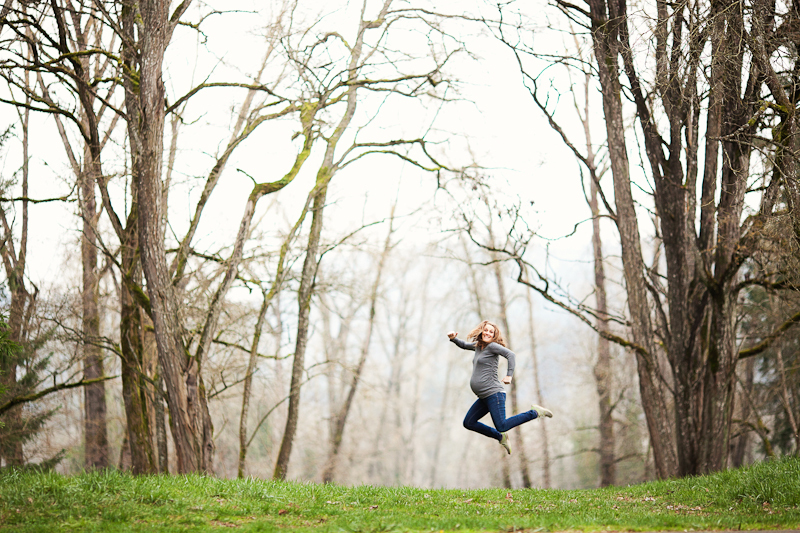 Although it was about this time that we learned we were pregnant so Erin’s slacklining days were shorter than the rest. We planted our garden again this year and quickly learned of Sage’s love for strawberries. It was super fun to watch her navigate her way to the strawberry patches and pick as many berries as she could eat. She would eat them whole–stem and all! Later in the summer it was tomatoes that she would pick and eat like an apple. John kayaked the Illinois River (Oregon) for the fourth time. This is a three day trip on a very remote, 30+ mile stretch of river in Southern Oregon. He leaves early, early Friday morning, is on the river just after lunch and is back home by nightfall on Sunday evening. It’s a beautiful stretch of creation! 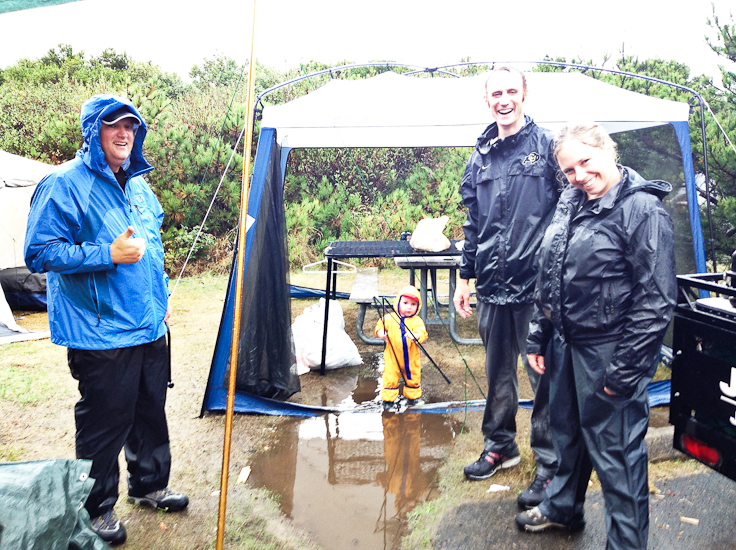 We stuck out the annual “Pete’s Birthday Camping Weekend” despite the forecast calling for rain all weekend long. It ended up being much better than expected, but we still decided that perhaps June camping in Oregon is better done in a house in Central Oregon rather than in tents at the coast. =) It didn’t phase Sage, though. We just threw on boots and waterproof “bubble suit” and she was completely happy (although the photo looks quite sad, she really did have a good time!). June ended and July began with a visit from a long time friend, Kim (Grimes) Porter. She has lived out of the US since 2008, but we have been able to see her once overseas and two other times here in the States. It was good to be together! We rolled through July in a blink! The every three year Macy Family Reunion started off the month and we extended the weekend through Wednesday enjoying another several days of camping at Nehalem Bay State Park. This time the weather was better and we even got in a beautiful morning hike up to the top of Neah-kah-nie Mountain (pic below). In between beach weeks we squeezed in photographing two weddings, a couple of newborns, an anniversary party, and an engaged couple; make a weekend trip out to Bend; and had our first pre-natal appointment for Tiny. The Macy Beach Week is always a summer highlight and this year was no different. 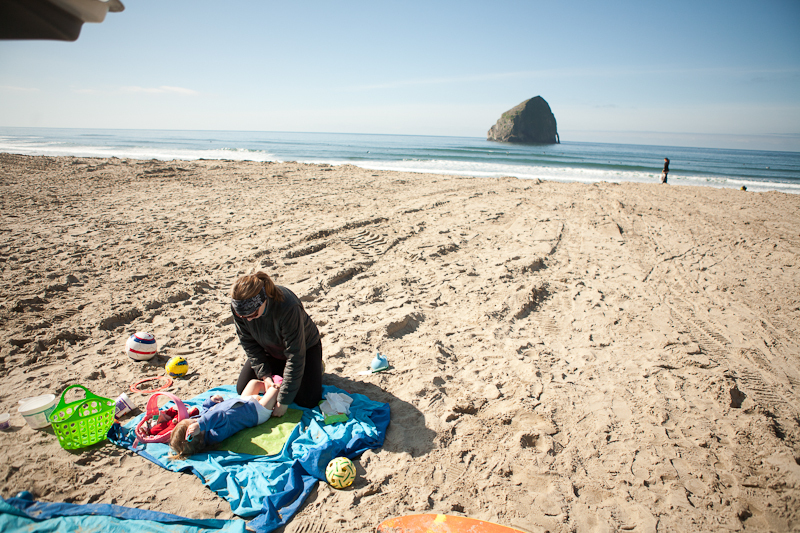 There’s always the fun traditions of a day in Cannon Beach, a trip to the Tillamook Cheese Factory, s’mores and sparklers around the campfire, and, of course, a new family photo! It’s a great time of being together, sharing meals, catching up, playing together, and just chilling out. The month of celebrations! Erin’s Birthday (Aug 3rd – turned 34 this year); our anniversary (Aug 14th – 8 years! ); and John’s Birthday (Aug 28 – 35 this year). We have traditionally gone backpacking for our anniversary, but this year it was just too much to squeeze in. We did, however, fit in the Providence Bridge Pedal (pic below). We also spent LOTS of time outside. Sage hasn’t shown us she’s a full on water baby yet, but she certainly enjoyed dumping water into the bins and playing with the hose. It’s a start, at least! Our last family camping trip of the summer was in our new Jumping Jack trailer. This thing is awesome and even though the trip was a little last minute, it was great to get out at Detroit Lake. Sage loved playing in the dirt and we all loved the new trailer! Sage and Will share a sweet moment. She likes babies, but isn’t so sure about her mom holding other babies (or kids, for that matter). We shall see how things go when Tiny arrives. We did a little combined family photo session at one of our favorite summer places–Bear Hollow–where we go each year to pick blueberries. Oh yeah, she’s still got it! John was able to spend a weekend backpacking with a few long-time friends. The original plan was to climb South Sister, but the forest fires around Sisters prevented the summit so they opted to do climb up Mt. Jefferson instead (not quite all the way to the top as it gets a little technical toward the end). We busted our butts between May and September with the knowledge that in October we would be going to Hawaii. Well, we didn’t exactly know that in May, but by July we had decided it must be done. 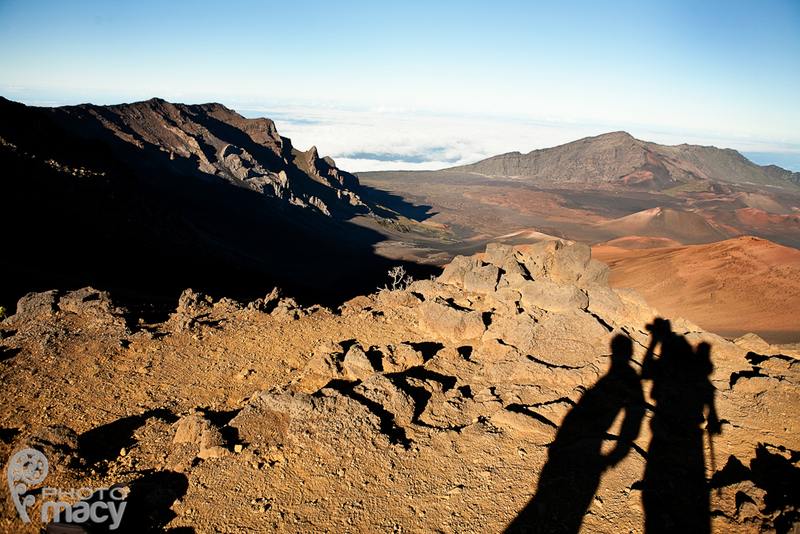 We have a full post on our time in Maui, which was a vacation that was definitely anticipated. Our little reader continues to amaze us with her attention span for book reading. She and John did not get through this whole stack in one sitting–it was a little ambitious–but her love of reading is something we hope to continue to encourage! Oh yes, Halloween came. Sage got to wear her skeleton pjs all day long. We did host a small Halloween party. 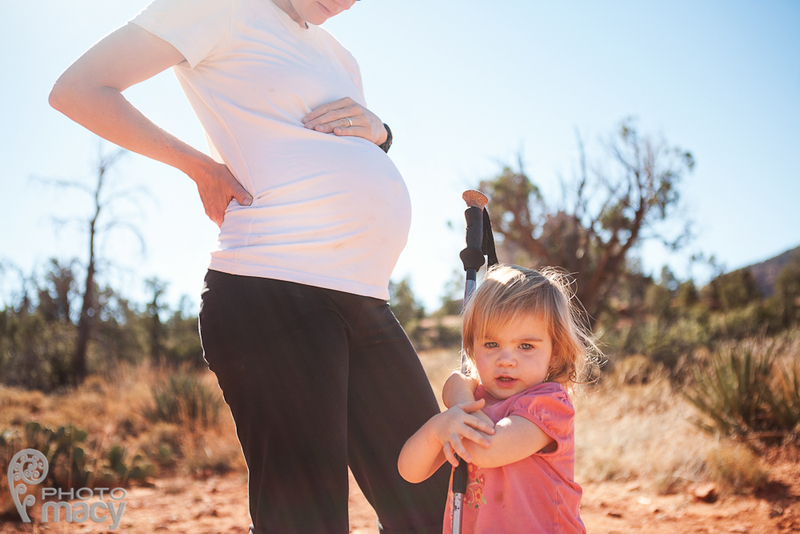 The first couple weeks of November brought another big push to wrap up our photography season and give ourselves some time off to think about and prepare for having a baby. At the end of the hard work was our third consecutive Thanksgiving trip to Arizona and Mexico. We spent time with friends, hiked for two days in Sedona, and then made our way to Juarez. 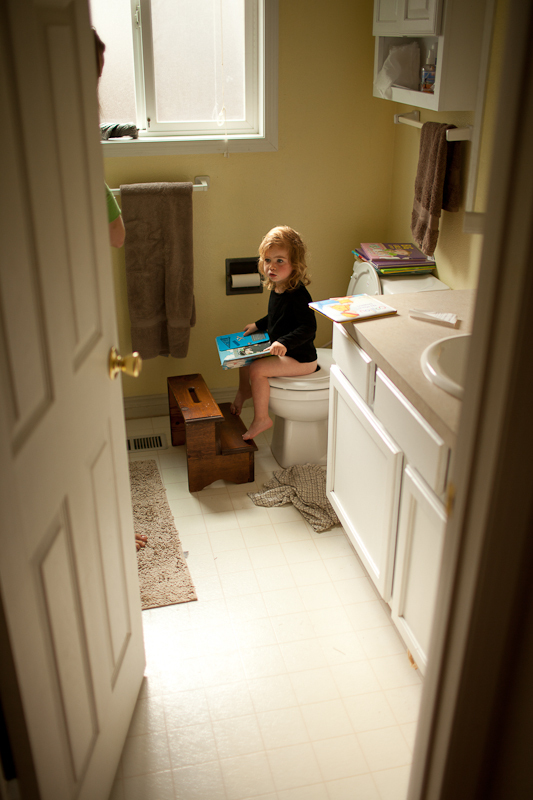 One week after Thanksgiving we started POTTY TRAINING! Oh my…it was/is a good reminder of how tough kid-training can be. It’s been awhile since we had to do any training types of things (i.e. sleep training, food/eating training) and we had been cruising along perfectly fine. But, with the baby coming and a diaper rash situation for Sage that we have battled for months we decided it was time. It’s hard. But it’s good. We are now on week two and there are promising signs that she will catch on. 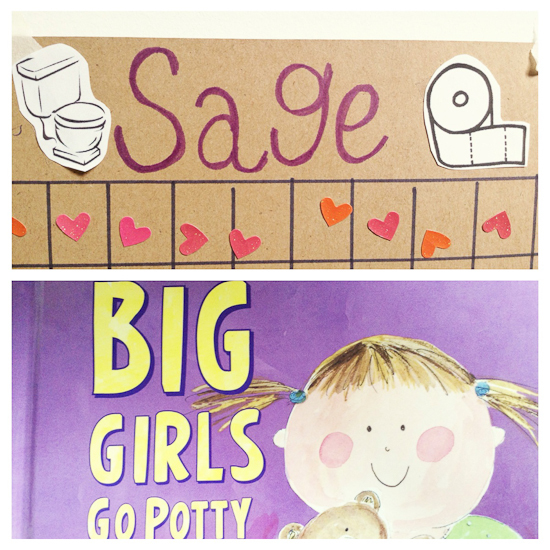 In the mean time we keep a stack of towels clean and our vinegar spray nearby, spend lots of time sitting on the potty reading books, and allow Sage to watch a short potty movie from time to time (which is what she and John and Baby are doing, below). Looking back over the year we are so grateful for so many things, particularly people. None of the things we have done in the past year are meaningful outside of the relationships we treasure with friends and family. We are blessed to have family near and to have a wonderful community of friends–both of whom provide us amazing support and love. Each of the three years we have been to Juarez for Thanksgiving we have had similar experiences, but also very distinctly different experiences. Some of the differences have to do with the particular group of people assembled for the build, some of it has to do with the family we are building for and their individual situations and needs, and even the weather variance has helped create clear memories for each year. The first day always begins around the foundation of the home with introductions and discussing how things are going to happen. We have experience just about every kind of weather in Juarez. Year one: temps below freezing; year two: rain; year three: sun on day one…and then serious wind on day two. It was great to be in short sleeves though! Marissa is a pro at this! (L) Eldest son, Carlos, (R) was eager to help and jumped right in with whatever he could. Me with Susy, one of the most gracious and beautiful women you will ever meet. Six out of seven kiddos with mama in the background. Susy and Leo–our hosts and truly incredible people. Another distinction of this year will be the prayer walk we did in the neighborhood where we built. We just walked down the street and if people were out we chatted with them, asked them if there was anything they would like us to pray for them about. We also gave them a simple water filtration device if they did not have one. I was amazed at how open people were, willing to talk about hard things, and eager to let us pray for them. Three generations working together–so fun! One of the neighbor boys who got in on the painting. It’s official! With the passing of the keys and dedication of the home, it’s theirs! Poor Jeremias wasn’t so sure about things. The whole gang! We are crowded inside because of how windy it was outside. Wind means dusty, sandy dirt in your eyes. I loved the notable difference in being outside and then stepping inside to such a peaceful, warm, and dry space. Sage spent her break times at the Team Center pushing “Baby” on the swing. This little girl is named America. She’s the niece of Sandra, the daughter of Jesus, and she was as cute as could be! Again our neighbor friend wanted to be in on the action. Here he is serving food during the neighborhood food outreach time. Love it. Remember that little neighbor boy? This is his father, Pablo. I chatted with Pablo a few times and as it turns out he makes and sells sweet treats in the community. He wasn’t pushy in the least–he just stood here with his pole of candied apples. On the first day of our build he actually brought over a big bowl of sugar covered donuts he had made to sell. He just walked around and offered them to each of us working. They were delicious! Pablo was a highlight for me. When we asked the Missions Ministries staff about it later and whether or not we should offer to pay him they said that it was a gift and that he was doing it because he was grateful we were there helping his community. Pablo brought his two kids over on day two and everyone helped paint. It was such a beautiful, simple offering. One of my favorite photos of the trip (taken by Krista Beard). 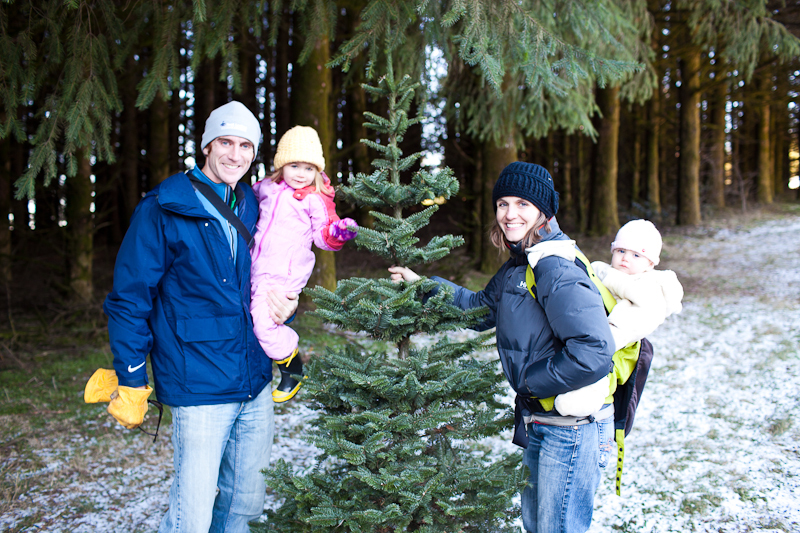 Something that didn’t get photo documented was a visit with the family we built for last year. Jasmine and her two sons, Fidencio and Alvieri stopped by the Team Center and we were able to catch up with them and see how well they are doing. It was hope-building for me as I remember these two boys having the same look as Carlos and Sandra’s kids–that of just surviving. The boys lacked energy last year and the youngest (who was maybe 3 at the time) just sat on Randee’s lap most of the time. There was a marked difference in all three of them. Energy, smiles, running, laughing, fuller faces, life-filled faces. It was so encouraging and good to see, giving me the hope that perhaps next year when we see Carlos and Sandra and their eight kids that we would see similar improvements. Always so much conversation that takes place during and after a trip such as this. There’s often an overwhelming feeling–so much need, but an apparent lack of resources and options. 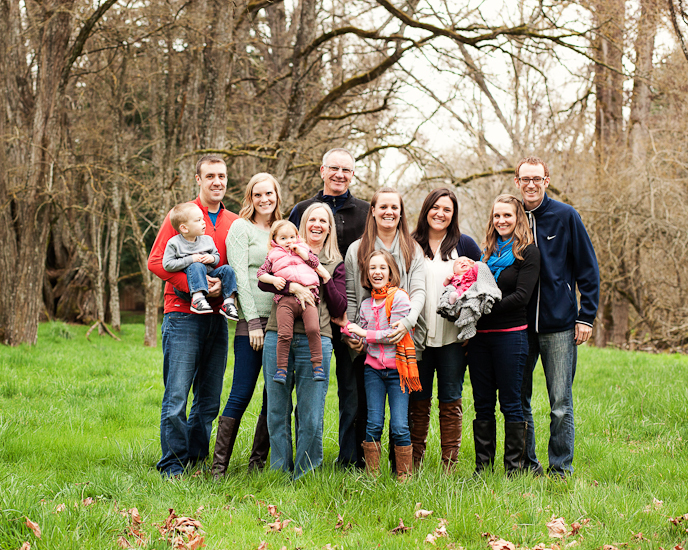 It’s great to know we impacted the lives of this family and, we pray, generations to come. Yet it doesn’t feel like enough and we wonder what else can be done. We were so grateful to have the chance to be with the Missions Ministries folks and our Thanksgiving team once again and look forward to being part of this project in one way or another for years to come!